A very simple blog by a non-blogger who has the occasional thought he wants to post. Simon is a Christian minister who has the privilege of serving the people of St Mark's Anglican Church, Malabar. I recently read John Dickson’s new booklet, Hearing Her Voice: A Case for Women Giving Sermons.1 The booklet aims to be thought provoking and the more I think about it the more I disagree with John’s central assertion. If you are interested in the topic, I certainly recommend you read the booklet for yourself (it’s refreshingly short). I’m going to try and summarise the central argument here. Dickson argues that of the many ‘types’ of speech found in the New Testament (for example teaching, exhorting, prophesying, evangelising, reading etc) “Paul restricts just one of them to qualified males”, and that is ‘teaching’. Dickson asserts that we must focus on how teaching differs from prophesying and exhorting etc rather than taking the broadest possible meaning of the Greek word for teach. Teaching therefore takes place “through the memorizing and rehearsing of all of the fixed information the apostles had laid down for the churches.” Sermons do not serve the purpose of laying down the deposit (which is now fixed in the NT canon) but expounding and applying the text where those traditions are preserved. Dickson argues that the modern sermon is much closer to what Paul would call ‘exhortation’ (parakalew). 2 Tim 2:12 therefore does not restrict a woman from delivering sermons to a mixed congregation. This is obviously a very short summary of a larger argument, but I hope that it faithfully captures the key points John Dickson makes in Hearing Her Voice. It is sometimes the case that authors use a word in way it is not normally used and to mean something it does not normally mean. When this is the case we expect to find sound evidence within those texts to show that the word is being used in a modified way. It is not enough to show this sort of ‘technical’ use could be possible. It must be shown from those letters themselves that it is being used in that ‘technical’ way. Firstly then, where does Paul use ‘teaching’ language in the Pastoral Epistles? The verb didaskw (to teach) is found five times in the pastoral epistles (1 Tim 2:12, 4:11, 6:2, 2 Tim 2:2, Titus 1:11). 1 Timothy 2:12 I do not allow a woman to teach or to have authority over a man; instead, she is to be silent. 1 Timothy 4:11 Command and teach these things. 1 Timothy 6:2 Those who have believing masters should not be disrespectful to them because they are brothers, but should serve them better, since those who benefit from their service are believers and dearly loved. Teach and encourage these things. 2Timothy 2:2 And what you have heard from me in the presence of many witnesses, commit to faithful men who will be able to teach others also. Titus 1:11 It is necessary to silence them; they overthrow whole households by teaching what they shouldn’t in order to get money dishonestly. 1Timothy 4:6 If you point these things out to the brothers, you will be a good servant of Christ Jesus, nourished by the words of the faith and the good teaching that you have followed. 1Timothy 4:13 Until I come, give your attention to public reading, exhortation, and teaching. 1Timothy 4:16 Pay close attention to your life and your teaching; persevere in these things, for by doing this you will save both yourself and your hearers. 1Timothy 5:17 The elders who are good leaders should be considered worthy of an ample honorarium, especially those who work hard at preaching and teaching. 1Timothy 6:1 All who are under the yoke as slaves must regard their own masters to be worthy of all respect, so that God’s name and His teaching will not be blasphemed. 2Timothy 4:3 For the time will come when they will not tolerate sound doctrine, but according to their own desires, will multiply teachers for themselves because they have an itch to hear something new. Titus 1:9 holding to the faithful message as taught, so that he will be able both to encourage with sound teaching and to refute those who contradict it. Titus 2:1 But you must say the things that are consistent with sound teaching. Titus 2:7 in everything. Make yourself an example of good works with integrity and dignity in your teaching. Titus 2:10 or stealing, but demonstrating utter faithfulness, so that they may adorn the teaching of God our Savior in everything. The noun didache (the activity or content of what is taught) is found twice (2 Tim 4:2, Titus 1:9). 2 Timothy 4:2 Proclaim the message; persist in it whether convenient or not; rebuke, correct, and encourage with great patience and teaching. The noun didaskalos (teacher) is found three times (1 Tim 2:7, 2 Tim 1:11, 4:3). 1 Timothy 2:7 For this I was appointed a herald, an apostle (I am telling the truth; I am not lying), and a teacher of the Gentiles in faith and truth. 2 Timothy 4:3 For the time will come when they will not tolerate sound doctrine, but according to their own desires, will multiply teachers for themselves because they have an itch to hear something new. The adjective kalodidaskalos (teaching what is good) is found once (Titus 2:3). The verb eterodidaskalew (to teach contrary to standard instruction) is found twice (1 Tim 1:3, 6:3). The noun nomodidaskalos (teacher of the law) once (1 Tim 1:7). 1Timothy 1:7 They want to be teachers of the law, although they don’t understand what they are saying or what they are insisting on. There are clearly a substantial number of uses of ‘teaching’ language in the Pastoral Epistles.5 Should someone wish to build the case that in the Pastoral Epistles ‘teaching’ “is a technical word for laying down the apostolic deposit” then this is the material that must support the case, or against which that case must be tested. What is highly surprising about John Dickson’s argument is the lack of evidence he presents to support his view that a more technical use of didaskw must be in Paul’s mind in 1 Tim 2:12. It is his starting point for examining the topic of “what teaching really is” rather than his conclusion. He examines the historical background and the place of written and oral tradition. He mentions the various other words Paul uses to describe speaking activities and examines passages from other letters. But no-where does he review, let alone examine in detail, the many many uses of ‘teaching’ language in the Pastoral Epistles to argue his case that in the Pastoral Epistles it must have a technical meaning. Rather than arguing and developing a case grounded in the Pastoral Epistles it is the presupposition he brings to these texts. What then do we find when we look at the Pastoral Epistles? Paul opens his first letter to Timothy by exhorting him to remain at Ephesus so he can carry out the tasks Paul gave him. Chief among these is to command certain men “not to teach different doctrine” (eterodidaskalew, 1:3). Those who swerve from “a pure heart and a good conscience and a sincere faith” also wander into “empty talk”. These people want to be “teachers of the law” (nomodidaskaloi, 1:7) but don’t have a firm grasp of the things they say or speak confidently about. So right from the beginning of this letter teaching, and false or inadequate teaching, is very much an issue. Like Paul, Timothy is to hold fast to the gospel of truth and a good conscience. In 2:7 Paul says he has been appointed a herald and apostle of the testimony about Christ, or in other words, “a teacher of the gentiles in faith and truth”. There is no indication that Paul adds “teacher” (didaskalos) to his roles as herald and apostle, rather this is another way of explaining these two roles. He is to teach others (and especially the Gentiles to whom he has been sent) the truth about Christ. Timothy is to do likewise. It is worth pausing at this point and asking, is there anything so far in the text which indicates (or better yet, demands) that Paul is using ‘teaching’ language in a specialised and unusual way? I don’t think so. It seems to be a simple case of people teaching different doctrine, desiring to instruct others in the way of truth but without the knowledge or godliness to do so. So far there is nothing in the text that hints at a different usage of ‘teaching’ language. Perhaps it could be argued that his audience was already familiar with Paul’s unusual technical use of this word, but that would be begging the question. It is interesting to note that information and action are closely related here, as with the rest of Scripture. The Christian teacher must be a godly person as well as convey the right information about Christ. What is shared is life and doctrine; there is an intimate connection between the teacher, what is taught and who is taught. This does not sit at all well with Dickson’s assertion that ‘teaching’ is “preserving and laying down the body of oral traditions first handed over by the apostles”. In the Pastoral Epistles the act of teaching and the content of what is taught is much more than just conveying accurate information about Christ. Teaching here necessarily involves making an impact on people’s lives. (Introduction) Let a woman learn quietly with all submissiveness. (Instruction) I do not permit a woman to teach or to exercise authority over a man. (Conclusion) Rather, she is to remain silent. This presentation somewhat clouds the grammar of these sentences where the command (a present imperative) is clearly “learn” in verse 11. First and foremost these are verses about learning. Paul says that a woman’s learning should be in quietness and in all submissiveness. This is reinforced by the repetition of quietness in 12b. Where there is learning, there is most often teaching, and Paul here says that women are not to teach men. They are to learn, not teach, when in mixed company. What then is being learnt and what is being taught? Surely it is the knowledge of the truth about the one mediator Christ and the godly life that flows from that saving knowledge. The immediate context confirms this, for men are to lift holy hands in prayer and women are to adorn themselves with good works. Paul’s purpose in setting out his instructions in this section is so that people may know how to behave in the household of God (3:15). His purpose is that godliness would flow from saving knowledge of Christ (3:16). Both of these aspects (doctrine and behaviour) are caught up in the activities of teaching and learning. Again, is there any firm indication that a technical usage of the verb “teach” is intended? None at all. The opposite is true. Unless he also intends an unusual technical usage of the verb “learn” then these words are being used in the ordinary Biblical way. Life and doctrine are taught by some, and learnt by others. If Paul had intended ‘teach’ to mean the act of authoritatively preserving and laying down an apostolic deposit then the opposite would not be ‘learning an apostolic deposit’, but not attempting to authoritatively lay down such a deposit. However Paul doesn’t say this. He begins by instructing women in this mixed setting to do something ordinary and readily understandable—to learn. He then prohibits women from doing something very straightforward and readily understandable—to instruct men in the doctrine of Christ and the godly life that flows from the gospel. We see this again in 4:11 where Paul again uses the verb didaskw (to teach). Having once again spoken about the deposit of good doctrine and the life of godliness that accords with it, Paul instructs Timothy to command and teach these things (both imperative verbs). If to teach things things is to “repeat the instructions just given”, why say command and teach? It would be a tautology. Is Paul really instructing Timothy to say these things, and say them one more time with meaning? Clearly Paul intends more than just repeating instructions verbatim. If, as Dickson claims, the instruction to teach means to “repeat the instructions just given” while any further reflection or application would be exhortation or even prophesying, why doesn’t Paul instruct Timothy to exhort or prophesy? Paul clearly expects Timothy to bring about a change in the godliness of this church, and yet the instruction is to command and teach. Clearly to command and teach these things includes all the words and example required for Timothy to execute this charge from Paul. As verse 12 makes clear, his teaching includes the example he sets. Again, we see the close connection between life and doctrine and the act of Christian teaching necessarily involves both. 1 Timothy 4:13 brings us to another example of ‘teaching’ language, one to which Dickson devotes some time. Timothy is to pay attention to three distinct things; the reading, the exhortation, the teaching. Dickson emphasises that this verse cannot be used to automatically equate ‘teaching’ with a sermon on a Bible passage (a little more on this later). If anything he argues that this activity would be exhortation. But before we jump to applying the passage let us first examine what this passage means. The command is that Timothy is to occupy himself or pay close attention to something, or in this case, three things. They are the reading, the encouragement (or exhortation) and the teaching. In all three cases it could be that Paul is strongly urging Timothy to devote himself to the content of the reading/encouragement/teaching or to the activity of reading/encouragement/teaching. Or it could be a mix of both (pay attention to the content so you can do the activity). Certainly Timothy has already been commanded to teach. He has not yet been instructed to encourage/exhort others but he has twice been encouraged to action himself (1:3 and 2:1). The triple use of the article certainly emphasises a particularity about this command. It could be that these are three well established practices in the church, but there is nothing in this letter itself to lend support to this view. More likely it is to emphasise the particular charge Paul has given to Timothy which seems to be confirmed by verse 14 where Timothy is reminded of the gift given to him. Verses 12, 15 and 16 emphasise Timothy’s personal growth and godliness. However Timothy’s personal growth in knowledge and godliness can’t be separated from the life of the church for as Timothy grows Paul expects growth in the church. The understanding that seems to best fit this context is that Paul is telling Timothy to pay close attention to his own personal devotion to reading the Scriptures, his consideration of Paul’s exhortation to him and his ministry at Ephesus and the teaching he has received from Paul concerning sound doctrine and the godly life that flows from being a follower of Christ. However, as he does these things he is perfectly equipping himself to teach and exhort others. Again, there is nothing to indicate a specialised use of the words teach or teaching. Further in this context there is no evidence to support the view that exhort means “a Christian reflection on a reading” as Dickson suggests. In 5:1 Timothy is told not to rebuke older men but rather to exhort/encourage them as he would a father. He is likewise to exhort/encourage others in the church in a way that is age/gender appropriate. Exhort here seems to be a call to “come and be present where the speaker is” (BDAG). Timothy is to set the example, others are to follow, and he is call them to follow in a way that is appropriate to the relationship. It makes little sense to understand exhortation here as “a Christian reflection on a reading”. 1 Timothy 6:2 is especially interesting because Timothy is commanded to “teach and urge these things”. He is to teach (imperative verb didaskw) and encourage/urge/exhort (imperative verb parakalew). Again there is no indication that what is intended here are two relatively distinct and readily distinguishable activities, one being to lay down an apostolic tradition and then secondly to encourage everyone to follow that tradition. The contrast is between teaching and encouraging people to live a life of godliness that flows from the gospel over and against what brings controversy and division because it does not accord with godliness nor sound doctrine (6:3-10). Teaching and encouraging are distinguishable but not separable aspects of the one charge given to Timothy (as also is the instruction to command in 4:11). Commanding, teaching and encouraging may well have different notions or ideas behind them but they are not necessarily different activities. It is not necessarily possible to encourage without teaching, nor teach without encouraging, nor command without teaching or teaching without commanding etc. I would argue that it’s not possible because they are not clearly different activities, at least not in the Pastoral Epistles. The significant overlap between these ideas does not make the ideas indistinguishable, but I think it would make it impossible to call them different activities. Were we to continue to work through the examples of teaching language in the Pastoral Epistles we would see the same pattern continue and so for the sake of space and time I won’t cover every other instance now. However some examples in the other Pastoral Epistles demand examination. 2 Timothy 2:2 is an example that best fits Dickson’s argument that ‘teach’ is a technical term meaning to “carefully preserve and lay down the traditions handed on by the apostles”. However in this verse Timothy does not teach at all, he entrusts (imperative verb paratiqhmi). Timothy entrusts what he has heard from Paul to others who in turn are able to teach. The grammatical construction emphasises their qualifications as men who are able/qualified to teach, which in the light of 1 Timothy clearly indicates the need for godliness and not just academic ability. That is, Timothy is to find those who are suitably qualified as godly mature Christian men and he is to entrust Paul’s words to them and they will in turn teach others. This of course seems to fit very well with Dickson’s technical use of the word ‘teach’. However, what Timothy does is not teach but entrust. Here Paul uses entrust and teach as near synonyms. However for Dickson to be correct this requires that Paul is also using “paratithemi” (entrust) in a specific and technical way in 2 Tim 2:2. This is highly unlikely and is certainly not true of the other use of this word in the pastorals in 1 Timothy 1:18 where it certainly can’t mean “to carefully preserve and lay down the traditions handed on by the apostles”. If in 2 Tim 2:2 Paul said, ‘what you have heard from me in the presence of many witnesses, teach to faithful men who will be able to entrust it to others also’ then there would be a much greater possibility that Dickson’s understanding would be possible. 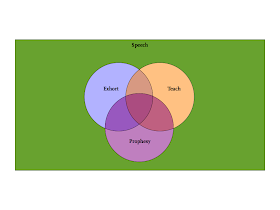 If Paul had used his ‘technical’ word first and followed it with a different word acting as a synonym then the meaning of the first word would impact our understanding of the second. However the fact that Paul first uses paratithemi, and not didaskw makes it virtually impossible for him to have a specific and technical meaning of ‘teach’ in mind. One final passage worth examining is Titus 2:1-15. Paul instructs Titus to speak (imperative verb lalew) in both 2:1 and 2:15. He must “say the things that are consistent with sound teaching”. If Dickson is correct and “sound teaching” is that apostolic deposit that has been laid down, then why would Paul not command Titus to ‘teach’ it? Why does he instruct him to say what is consistent with it? Again, if here ‘to speak’ is synonymous with ‘to teach’ and if Dickson if correct, then we once again have a technical and highly improbably usage of yet another word. And why would Paul then go on to instruct Titus to say that the older women should be “teachers of what is good” (using the compound word kalodidaskalos) if it is closely related to this specific activity of laying down the apostolic tradition? If Paul has this specific understanding of ‘teaching’ in mind in the Pastoral Epistles why use the words with such a lack of precision? Surely in all these cases Paul has the normal, everyday understanding of teaching in mind and that there is significant overlap with other speaking words. One of the central points John Dickson tries to make is that teaching, exhortation and prophesy, for example, are different activities. For example he cites 1 Corinthians 12:28, Romans 12:4-8 and 1 Timothy 4:13 to demonstrate that there are different types of speech serving different functions. John happily concedes that there is overlap between the different categories of speech, even “significant overlap”6, but there is also clear, although not “hard”7, distinction. Dickson concedes overlap among the meaning of these words, but wants us to focus on what is distinct and different. Further, he seems to want to define teaching by what is distinct and unique to teaching, and seemingly to disallow what is common from the injunction in 1 Tim 2:12. Dickson seems to be saying that areas A, B and C (above) aren’t really teaching, because they are not uniquely teaching.9 Only area D is uniquely teaching and so Paul is only prohibiting what is covered from area D in 1 Tim 2:12. Why? It is quite illegitimate to claim that because something is not unique to teaching it isn’t teaching. And if areas A, B and C really are teaching, they are surely included in Paul’s instruction in 1 Tim 2:12. On the one hand there is significant overlap, and on the other such massive difference that some continue to have a place in church life while teaching doesn’t? I am unsure how this can be possible. There is much more that can (and has over many years) been said on this topic. Overall I think that John Dickson presents an argument that is simple and clear, but that doesn’t stand up well when examined against the New Testament, and especially against the text of the Pastoral Epistles. It over-simplifies the New Testament teaching on this subject and the logic of the argument he presents doesn’t do justice to the complexities that exist in some New Testament texts. For example to claim “‘Teaching’ is the only type of speech he does not permit to women”11 appears to completely ignore 1 Corinthians 14:33-35 (As in all the churches of the saints, the women should be silent in the churches, for they are not permitted to speak, but should be submissive, as the law also says. And if they want to learn something, they should ask their own husbands at home, for it is disgraceful for a woman to speak in the church meeting.). To claim that 1 Corinthians 14 in no way restricts the speech of women in church would surely be a gross over-simplification (even distortion) of the argument of that letter. The best aspect of John Dickson’s booklet is the challenge to think more carefully about what Biblical words such as teach, command, exhort, prophesy, entrust, preach actually mean, how they relate to our speech today and to the role of men and women in church. We can never think too long and hard about how the Bible applies to our lives today. And this challenge is an ongoing one because the Bible’s framework for male/female relationships in the home and the church is increasingly counter-cultural. I don’t think John has the right answer when it comes to the word ‘teach’, or ‘exhort’ for that matter, but I will need to leave further thoughts on what these words mean and how I think these words relate to each other and the modern sermon for another time and another document (the demands of gospel ministry and family life don’t always leave the time for writing that I would like). However, I do think that this sort of consideration is happening all the time and Sydney Anglicans are certainly no exception in this. One only needs to look at the work taking place at the Priscilla & Aquila Centre at Moore Theological College and the interest in their annual conference to see that many are thinking through this issue deeply. This is not to mention the stream of talks and articles (and even the occasional book) produced from Sydney on this topic over many years. It would certainly not be right to say that this topic is being ignored or that many people’s views are held based on some tribal allegiance rather than careful consideration of the Scriptures. 1 As far as I’m aware the booklet, released on Christmas Day 2012, is currently only available as an e-book. I refer to it as a booklet simply because it is a very short book, it is in no way meant as a pejorative reference. 2 “ ...this is the default usage of the term in Paul’s letters, especially in the pastoral epistles.” Loc 407. Location references refer to the Kindle e-book version of his booklet. 4 John seems to vary between asserting that this technical use of teaching is the normal use for Paul almost everywhere (as noted in footnote 2), and saying that it’s the normal use in the Pastoral Epistles. Here I’ll mainly focus on Paul’s Pastoral Epistles. 5 I hope I haven’t missed any! 8 These diagrams are meant for broad illustrative purposes only. They aren’t meant to define the degree of overlap nor imply that the definition of each word is completely static regardless of context. 9 “Instead of giving the term the broadest possible meaning and excluding women from offering any extended speech in church, we should be exploring how teaching differs from prophesying and exhorting and then, from that conclusion, shape our contemporary practice.” (Loc 232).